Althoug helium is the second most abundant element in Universe, it is rare in Earth - less abundant, than gold or platinum. Any helium that is released into the atmosphere sooner or later will leave Earth : the speed of helium atoms is large enough to escape from the gravitational force of Earth. Helium is purified from natural gas sources: a few wells produce natural gas up to 7 % helium content. Amount of helium-rich natural gas deposits is continuously decreasing: hence, helium is a scarce non-renewable resource. Helium has the lowest boiling point among any fluid - this way, it is used in cooling of superconducting magnets used in tomographs, or in the Large Hadron Collider in CERN, Geneva. Helium is a small, single-atom gas, and it can be used in detection of minute leaks of confined spaces. It is used to leak-test cooling compressors, electric cabinets and other parts, where leaks are not allowed. Helium gas is a good heat conductor: it is used in cooling processes in manufacturing of optical glass fibers, precision casted parts. It has high ionization potential: this way, it is more and more frequently used in atmospheric plasma applications. Recovery of helium is economical in almost all application, where the collection of helium is possible. 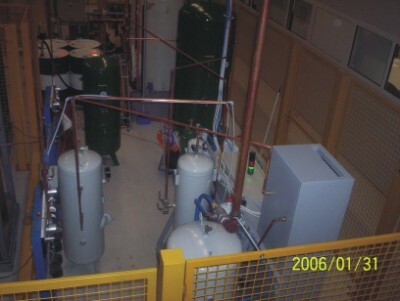 Closed-cycle recovery systems can be constructed for supraconducting magnets, or leak testers. As we are involved in ambient temperature processes, we focused on collecting and recovering helium used in leak testers. Different applications have different need for helium purity, pressure, volume. This way, recovery units may diffeer significantly from each other. For leak testing applications, HeliCycler leak testing system was developed. Although the pressure, purity requirements can be quite different, but the basic design of our HeliCycler units are the identical. HeliCycler system in an automotive part company. Helium is used to test several million car air condition compressors a year.